Boil rice. Add 1 teaspoon salt and 2 teaspoon turmeric powder while boiling. Before draining add lemon and leave it for about 2-3 minutes. Drain it. Take a kadai (wok) and heat oil. Add cloves and cinnamon and carrots and peas and sauté it for about 8-10 minutes. Add salt and garlic-green chillies paste. Add rice and lemon juice and mix it slowly with big spatula so that it doesn’t break. 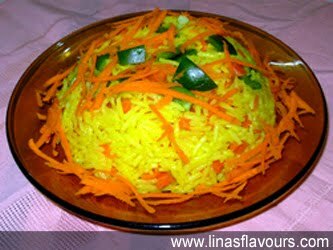 Garnish with carrot shreds and coriander and serve hot.